Visitors look at a model of JMSDF US-2 search-and-rescue amphibian plane during the MAST Asia 2015 defense exhibition and conference. Opening Japan’s defense industry to the international market is a significant step, but it won’t happen overnight. On April 1, 2014, Japanese Prime Minister Shinzo Abe lifted Japan’s arms embargo and established the “Three Principles on Transfer of Defense Equipment and Technology,” which allows Japan to export arms after proposals go through a rigorous screening process to ensure that the sale would promote international peace and Japan’s security. Even though the move to export arms has not garnered nearly as much attention nor controversy as Abe’s other security initiatives, this is a significant change in Japan’s defense posture. Fast-forward a year and a half — Japan’s Ministry of Defense (MOD) created the 1,800-person strong Acquisition, Technology, and Logistics Agency (ATLA) on October 1 of this year to deal with many of the practical challenges that remain to implement this new export policy. A staff of 50 within ATLA will be dedicated specifically to arms export promotion. On this historic occasion, this article will discuss what has motivated Abe’s new policy direction and explore the road ahead for Japan’s government and arms industry. Even though the Japanese government is motivated by both industrial and strategic concerns, uncertainty about how these changes will be implemented and the lack of international demand for Japanese arms will pose major difficulties. The high-profile proposals with India and Australia, concerning the US-2 search and rescue aircraft and the Soryu submarine, respectively, are unusual, and in the future Japan is more likely to focus on expanding the exports of smaller parts rather than such big-ticket items. What drove Abe to lift the arms export ban? According to Jeffrey Hornung, Fellow for Security and Foreign Affairs at the Sasakawa Peace Foundation USA, Japan wants to (1) lower the costs for domestic procurement, (2) increase cooperation with the U.S., and (3) be a more active security partner to like-minded, i.e. status quo, states. Lowering costs is a particular priority because of the exorbitant costs of domestically produced Japanese arms. If the Japanese government wants more capability, it is going to have to be able to acquire technology at cheaper prices. Because of high research and development costs, selling more of anything will almost always bring per-unit costs down. A good hypothetical example would be selling Soryu submarines to Australia – if Japan were to win the contract, the cost of each submarine would go down, as the investment in researching and designing the Soryu is a fixed cost that has already been paid. However, it is an open question whether the lifting of the arms embargo will have a marked change on prices any time soon. Realistically, such a price reduction could take years if not decades to materialize, as doubts remain about how competitive Japanese exports could be on the international market. Stephen T. Ganyard, president of Avascent International, points to the lack of demand for Japanese arms as a major obstacle to achieving the Japanese government’s objective. There is no demand for Japanese arms currently because of a lack of visibility, few globally competitive products, and steep prices, Ganyard explains. Until now, Japanese defense manufacturers’ only customer has been the Japanese government – which has led to a lack of market discipline in the industry. Japan’s defense sector is “a world of its own, with their own rules,” Ganyard says. Because the Japanese government – and not international markets – set the prices for Japanese arms, there is no mechanism to achieve efficiency, Ganyard concludes. Perhaps the greatest irony is that the countries likely to receive Japanese arms first, such as Malaysia, Vietnam, Indonesia, the Philippines, and Thailand, may not even be able to afford them. Countries that have the money to purchase the best, such as Singapore, will continue to source their arms from the U.S., as Japan’s arms are no longer at the cutting-edge, nor are they battle-tested. Hence, the short-term benefits of the lifting of the arms embargo from an economic perspective are questionable. However, it is critical for Japan to start injecting market discipline into the industry now, if only for the strategic benefit of demonstrating commitment to increasing capability. Arms exports and joint production are as much about internal balancing – strengthening Japan’s indigenous industrial capacity, reducing reliance on the U.S., and gaining the ability to fund tomorrow’s research and development from today’s profits – as it is about external balancing. These two facets are remarkably complementary, in fact. The proposal for submarine technology cooperation between Japan and Australia is a classic case of Japan trying to alleviate its abandonment fears vis-à-vis the U.S. by proving its commitment to “burden-sharing.” Here, external balancing (binding the U.S. closer to Japan’s security) meshes with internal balancing (developing Japan’s capability to provide for its own security). “By providing arms to these countries we can make money, we can balance China, and strengthen and institutionalize our partnerships and empower these countries. It’s a win-win-win situation,” Narushige Michishita, director of the Security and International Studies Program at the National Graduate Institute for Policy Studies, is quoted in Defense News as saying. Exports are the stimulus that Japan needs in order to incentivize better performance by its arms manufacturers – a turnaround that will benefit not only Japan, but also Japan’s allies and partners. As the U.S. faces greater budgetary pressure to make do with less, Japan will have to work harder to prove that they are an ally worth defending – and such “proof” comes in the form of making a serious commitment to reciprocate U.S. efforts to maintain peace and stability in the region. Significant hurdles remain, however, as Japan has virtually no experience using arms exports as a foreign policy tool. Though the political guidelines have been updated, they have yet to be codified or systemized – and businesses are not going to jump into the game until some of this ambiguity is cleared up. Actually drawing up these statutes will be tricky business, especially those regulating extra-purpose use and third party transfers. End-use monitoring has the potential to be a particular headache. As Ganyard points out, it would be catastrophic if Japanese arms ended up being sold to state or non-state actors that Japan would be “embarrassed” to be seen as supplying, even indirectly or inadvertently. He continues, “What Japan really needs right now is a few test cases, to see how the practice can be routinized.” In addition to giving clearer guidance, the Japanese government also needs to show a willingness to commit to sharing the risks of expanding defense production. This can be done through low-cost loans to potential buyers or research and development grants. For Japanese companies, Ganyard suggests in SankeiBiz, mergers are one way to “[create] strategic deterrence from a strong defense industrial base. This unique path would have Japan … buy its way into a position of global defense sector competitiveness through mergers, acquisitions, and the purchase of defense related intellectual property.” But here again, companies need to be incentivized. Japanese companies need to be convinced that – given the choice between acquiring a non-defense related company abroad, a process with clear rules of the road, and acquiring a defense-related company, where there is no certainty about what the future could hold – the international defense company is worth the money. The risks to businesses are not just financial, but also reputational. Large Japanese companies, such as ShinMaywa, Mitsubishi, Kawasaki, Hitachi, and Toshiba, do not want to be labeled “merchants of death.” The Maritime Systems and Technology arms fair was held in Yokohama this past May, drawing about 4,000 participants according to organizers. Though a significant step forward – this fair was the first of its kind to be held in Japan – the absence of guns, missiles, and “other blatantly threatening” gear from Japanese booths is telling of the Japanese mentality. Reputational costs also explain why the Japanese government was so eager to promote the sale of the US-2 planes – as a search and rescue aircraft, it was easier to bring the public along by framing it as a primarily non-military transaction. So where does Japan go from here? Hornung characterizes both the US-2 plane proposal with India and the Soryu submarine proposal with Australia currently being discussed as “aberrations.” In the future, he believes the focus will be on exporting, smaller niche components, such as missile-tracking sensors used in ballistic missile defense systems. The ATLA-embedded staff focused on promoting exports will hopefully play a larger role in advocating for Japanese exports and joint development projects, acting as a liaison, and running a better public relations campaign than what Mitsubishi and Kawasaki have been running so far in Australia. Just how quickly these reforms are implemented will depend on the political will that can be mustered – which in turn depends on “saber-rattling” by China and North Korea. 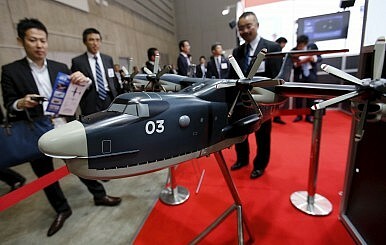 But the sheer challenge that Japan’s defense industry faces means that progress will be slow and cautious.